Sales of Toyota and Lexus Hybrid models have passed the 100,000 mark for the first time in half-yearly sales. Sales of cars with BMW diesels will also increase. Sales reached 101,000 units for the first half of the year, a 12 per cent increase against last year. Hybrid sales represent 22 per cent of total TME sales, an increase of +2 per cent points compared with the first half of 2014, confirming strengthening customer interest and confidence in Toyota’s hybrid technology. Lexus Hybrid sales have a strong momentum and increased by 40 per cent in the first half of the year, to reach 20,500 units. Lexus Hybrid Drive represents 62 per cent of the total Lexus sales, reaching 96 per cent in Western Europe. The Toyota Auris Hybrid has performed well with sales reaching 19,330 units, representing 43 per cent of Auris sales, while the Toyota Auris Hybrid Touring Sports represents 65 per cent of the Auris Touring Sports sales. The Toyota Yaris Hybrid achieved a 21 per cent increase in sales versus the first half of 2014 to 36,400 units, showing the strong acceptance of the new model launched last summer. In the first half of the year, over one Yaris out of three sold in Europe is a hybrid. Meanwhile Toyota Motor Europe (TME) has announced second quarter sales of 220,900 Toyota and Lexus vehicles, bringing the half-year total sales to 451,000 units and the group’s market share to 4.6 per cent for the six-month period. TME sales results were driven mainly by the increase of sales in Western Europe (+6 per cent) and Central Europe (+15 per cent). Sales in Eastern Europe (Russia, Ukraine, Kazakhstan and Caucasus) fell by 35% in spite of a market drop estimated at -38 per cent. This allowed TME to claim that Toyota and Lexus’s combined market share increase by 0.3 per cent points. In tune with the current move to downsize powertrains to achieve improved fuel economy and driving dynamics, as well as lower emissions, Toyota has replaced the previous 2.0-litre D-4D diesel engine in Avensis with a new 1.6 D-4D unit. This Euro 6-compliant engine, with a six-speed manual transmission, is 20kg lighter than its predecessor. It develops 110 bhp at 4,000 rev/min and 270Nm of torque from 1,750 to 2,250 rev/min. This gives 0 – 62 mile/h acceleration in 11.4s and a top speed of 112 mile/h. The engine posts an eight per cent improvement in fuel efficiency compared to the previous 2.0 D-4D, with combined cycle fuel consumption of 68.9mpg; at the same time, CO2 emissions have been reduced from 119 to 108g/km. The engine has been tuned for fast throttle response throughout the rev range. It generates good initial response at low rpm, then, as turbo boost develops, a linear build-up of torque. The availability of torque has been extended, so the engine will rev feely beyond 3,000 rev/min without running out of breath. The new Euro 6-compliant 2-litre D-4D shares the low fuel consumption and emissions performance of its 1.6-litre sister unit, but it has been tuned for a stronger focus on performance. The new engine develops a maximum 141 bhp at 4,000 rev/min and a torque of 320Nm of torque from 1,750 to 2,500 rev/min. Its linear torque build-up and willingness to rev gives it particularly strong in-gear responsiveness and acceleration: it will move the car from rest to 62 mile/h in 9.5s and reach a top speed of 124 mile/h. Numerous developments, including a new timing chain, offer quiet running at all speeds, and Toyota’s stop and start technology, coupled with a tall sixth gear for motorway cruising, help the 2.0 D-4D return average fuel consumption of 62.8mpg with 119g/km CO2 emissions. Toyota Motor Europe uses 1.6- and 2-litre diesels from BMW and Toyota modifies them to its requirements. 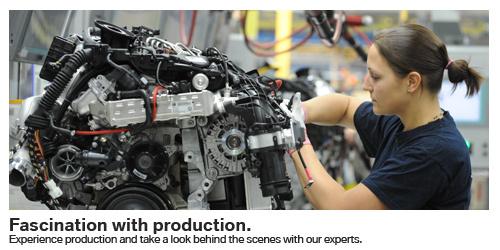 It is understood these engines are not used in BMW products in the same specification. As to sales this year, until Auris and Avensis sales start, only Verso has carried the BMW engine. In the first half year when sales were 1,013. Toyota sources the diesels from BMW’s Steyr, Austria engine plant (pictured below) which in 2014 made nearly three times as many diesel engines as gasoline units, namely 784,548 diesel engines and 273,422 gasoline engines. Steyr is the diesel engine research and development centre for the entire BMW group. The plant makes three-, four- and six-cylinder diesel engines for BMW and Mini, and three, four- and six-cylinder engines. However, some components are specific to Toyota’s vehicles, including the intake system, the cooling system and the engine mounts. Toyota Manufacturing UK: opened in 1992, TMUK today builds the Avensis saloon and tourer and Auris hatchback and Touring Sports, including hybrid models. It also produces 1.6 and 1.8-litre petrol engines and assembles hybrid engines at Deeside. Toyota Motor Industries Poland: TMIP is home to production of 2- and 2.2-litre diesel engines for Avensis, Auris and RAV4 and the 1.4-litre D-4D unit featured in Yaris, Auris and Corolla. The factory has been in operation since 2005. Toyota Motor Russia: Toyota’s newest European production centre began operations in St Petersburg in 2007, manufacturing Camry saloons. This year it is set to add stamping and plastics production to its business. Interestingly, Toyota’s Russian facility is preparing to manufacture RAV4 from 2016.